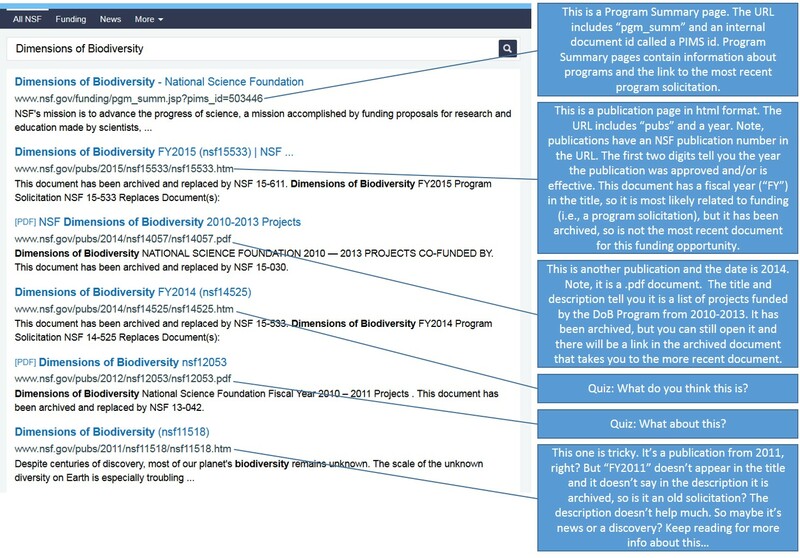 What’s the trick to finding what you’re searching for on nsf.gov? With Halloween 2015 approaching, you’ve probably been thinking about a lot of scary things. We know navigating nsf.gov can be scary for some people, especially first time visitors. So we thought we should shed some light on the process to make it less scary. Grab some candy, and enjoy this treat. Let’s type something into the search box and see what results we get. 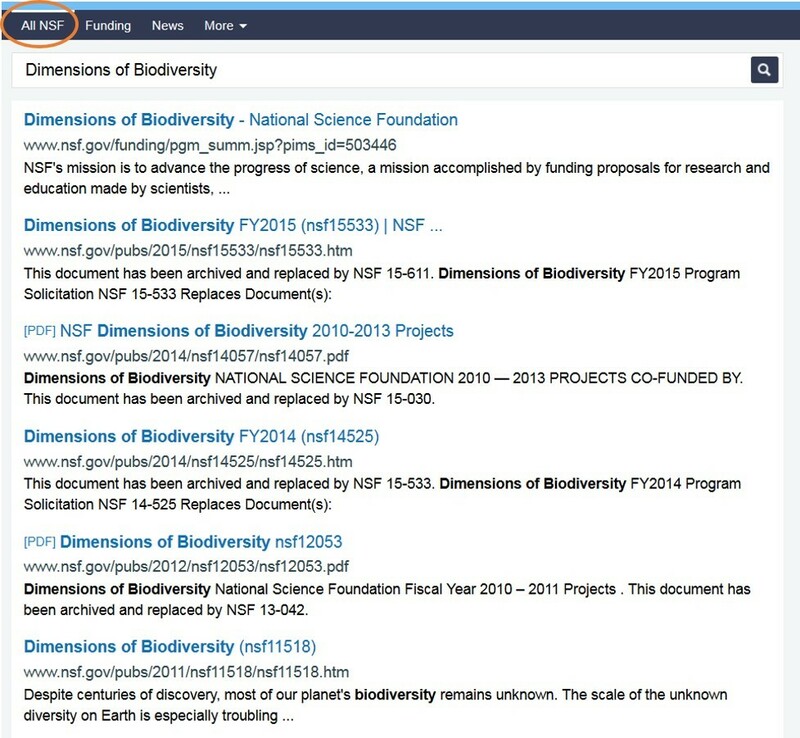 We’ll search “Dimensions of Biodiversity,” which is the name of one of BIO’s funding programs. Hit enter and you will see a page full of results like those you see in the screen capture below (assuming no files have been changed “behind the scenes” since this blog post was written). The initial set of results is from a search of “All NSF,” meaning all of nsf.gov. So what are all of these results?!? We are going to demystify them for you. The best way to find what you are looking for is to look at the URLs of the pages in addition to the page titles and descriptions. Here is an annotated version of the search results, set to “All NSF”. Finally, filter your results with the “Discoveries” filter. 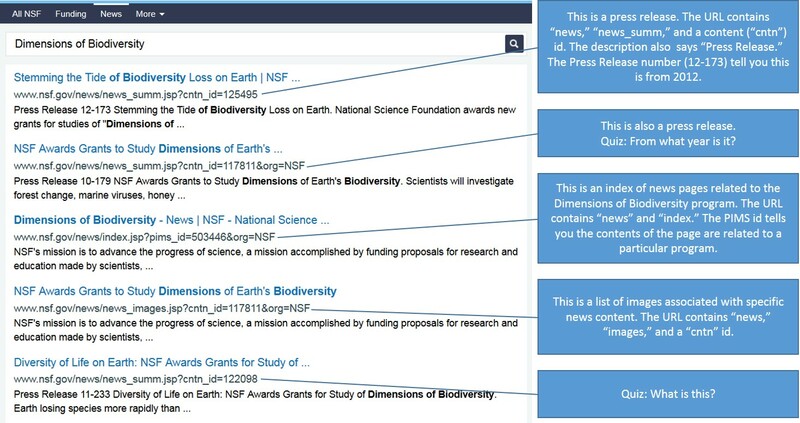 Discovery items are stories about NSF-funded research and are different from press releases. Now, let’s return to the last item in your unfiltered search results…the tricky publication from 2011. Does the page contain news or discovery content? How do you know? We hope this quick guide has cleared away some of the cobwebs and given you a better view of how nsf.gov is organized.